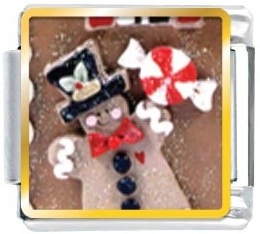 The gorgeous cookies measure (approximately 1″ in diameter) and are decorated with Gingerbread men and ladies. 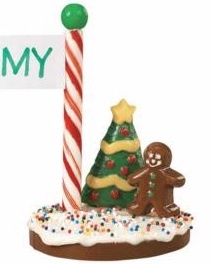 Snowmen, reindeer, candles, Christmas trees, stockings, stars, candy canes, and Santa. 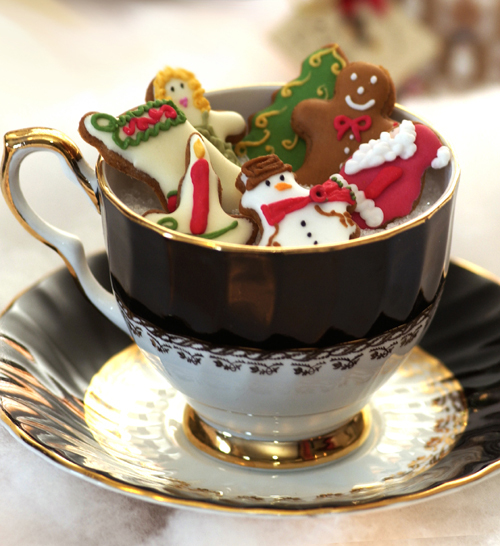 Cookies are made from really tasty cinnamon snap dough from January to August and from September to December they are Gingerbread. Details here. Candytown Dessert Plates. 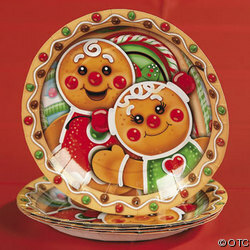 Perfect for holiday goodies, these candytown dessert plates have a fun gingerbread man design. The little Gingers have the cutest faces with big bright eyes and smiles! 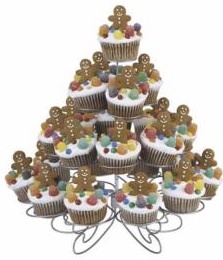 Use them to serve snacks at your next Christmas party or create festive cookie gifts for friends and neighbors. Paper. (8 pcs. per set) 7″. Not too late to order for the upcoming holiday! 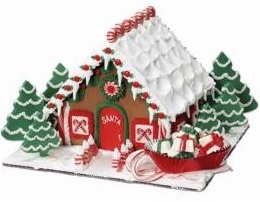 Holiday Chalet takes a more adult approach to decorating our Pre-Baked Gingerbread House. 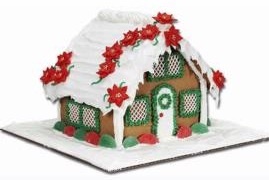 Make-ahead poinsettias are scattered over the roof; simple leaves and holly berries outline the windows and door. Visit here for recipe and pattern.